California's Russian River Valley is home to Martin Craig Luminist, a boutique Chardonnay masterfully made in collaboration with winemaker Glenn Hugo. And Boundary Post Ranch Kestrel Pinot Noir is the embodiment of balance acidity and Napa Valley viticulture. 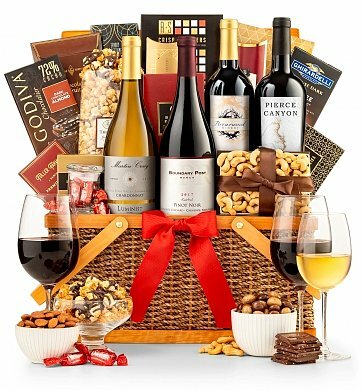 Paired with two more red wines and a spread of tastings both savory and sweet, this wine basket will be adored and savored. One bottle each of Martin Craig Luminist Chardonnay, Boundary Post Ranch Kestrel Pinot Noir, Pierce Canyon Reserve Cabernet Sauvignon, and Briarwood Zinfandel. For more information on these wines, please see the Tasting Notes. Luxury Chocolate from Ghirardelli, Godiva and more. Smoky Maple Cashews, Seasoned Almonds, Fresh Peanuts. Chocolate Drizzled Gourmet Popcorn, Chocolate Toffee and more. Wine Cards Containing Production & Tasting Notes, Cellaring Information and Pairing Suggestions. See images. Each gourmet item is carefully assembled, and the gift is accentuated with a hand-tied satin ribbon. A free card is included with your personal message or greeting, as well as complimentary scissors so your recipient can easily open their gift. Your gift will leave a lasting impression as they continue to use and enjoy this keepsake wicker picnic basket with wood supports and dual handles. Personalize it! A name, date or message can be printed on ribbon, hand-tied around this gift. One line up to 45 characters; text repeats around ribbon.Complete the personalization instructions at checkout. Measures 17" x 12" x 10". The Monterey is a hand delivered gift. These gifts are delivered by one of our local design centers located throughout the United States and Canada. Same day delivery is available for most gifts when ordered before the cutoff time. The cutoff time for The Monterey is 1 PM in the recipient's time zone. Boundary Post Ranch Kestrel Napa Valley Pinot NoirEnjoy baking spice and rose petal aromas, lush notes of dark cherry and the earthiness of this medium-bodied Pinot with an elegant, balanced acidity. Fresh Virginia PeanutsExtra-large Virginia peanuts that are fresh and flavorful with a distinctive crunch. All-natural salt enhances the flavor of these premium peanuts. Martin Craig Luminist Russian River ChardonnayThis vibrant Russian River Chardonnay boasts radiant aromas of orange blossom and lemon zest, balanced by stone fruit notes and a smooth, light oak finish. Smoked Maple CashewsCashews smoked to perfection and infused with real maple syrup. Great with a cocktail or simply on their own! Briarwood Winery Select ZinfandelInviting and alluring, this old vine Zinfandel tempts with aromas of baking spices, berry bramble and toasted oak. It's a truly classic California Zinfandel. Creme CaramelsThese special caramels offer that long, satisfying flavor experience your mouth has been waiting for. Crafted from simple, premium ingredients. Golden Honey SticksStraws are filled with 100% pure, Kosher certified star thistle honey. With no artificial colors or flavors, honey straws are an excellent choice for a burst of sweet goodness. From Savannah Bee Company. Three straws included. Oatmeal Tea CookiesPerfected through years of fine tuning, these wholesome cookies are made of real rolled oats and have a crispy, crunchy, delightful flavor. Perfect with tea or a smooth cup of coffee. Pierce Canyon Reserve Cabernet SauvignonThis 2016 Cabernet has deep and balanced acidity with aromas of dried cherries, cedar cigar box and a hint of black plum. An agile falcon with keen eyes, the American Kestrel glides on the cool winds from San Pablo Bay, guarding the rows of Napa Valley's Mitsuko's Vineyard where Pinot Noir vines are nurtured. Enjoy baking spice and rose petal aromas, lush notes of dark cherry and the earthiness of this medium-bodied Pinot with an elegant, balanced acidity. Inviting and alluring, this old vine Zinfandel tempts with aromas of baking spices, berry bramble and toasted oak. It's a truly classic California Zinfandel, best enjoyed with grilled steaks, barbecue pork, corn on the cob and roasted vegetables. With a brightness that can only be claimed by Sonoma County's sun-soaked Russian River Valley, our Luminist Chardonnay is masterfully made in collaboration with winemaker Glenn Hugo. Radiant aromas of orange blossom and lemon zest are balanced with stone fruit notes and a smooth, light oak finish. This 2016 Cabernet has deep and balanced acidity with aromas of dried cherries, cedar cigar box and a hint of black plum. On the palate, flavors of blackberry jam and toasted walnuts balanced out the vanilla notes acquired from the French oak aging. Russian River Chardonnay, Napa Valley Pinot Noir, Cabernet and Zinfandel. Gourmet pairings including fresh nuts, luxury chocolates and confections. Arranged in a keepsake picnic basket with a complimentary note card.